This winter has been recording breaking for the amount of snow fall that we’ve experienced in New York City in years. Last time I checked we were at about 55 inches of snow. The total inches of snow that we’ve had last year was at 25 inches and we are not done yet. I’m so over the snow. I have not been wearing anything really nice and exciting because the snow, slush, ice, and salt won’t allow me to be great. This weather is so depressing, but it won’t last for long. Without winter we can’t appreciate spring and the four ladies above have me anticipating one of my favorite seasons. Regina Hall looks radiant in this cream lace dress with scalloped edges paired with strappy platform sandals. Lace is a staple for spring and cream is a great color. During New York Fashion Week, Solange killed the street style and slayed the front row. For spring you can try a color block trench coat similar to Solanges wool coat. Let’s not forget about the white pump and light pink suit. Borrow this look from the boys and put a feminine touch on it with a dainty color. 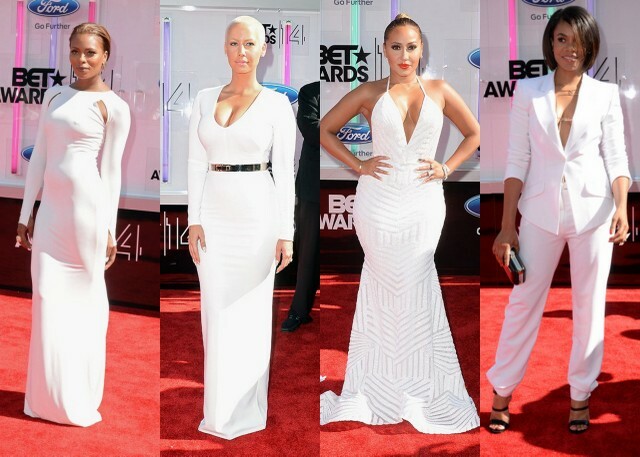 I’m loving Kat Graham’s all white look. The white fitted dress with white pumps, and white overcoat is so clean. I love the texture on the dress as well. This might be my favorite look!. I’m working on my legs now so they can look this amazing in shorts come spring and summer. I love the soft pink and white combination with the loose fitting paper bag shorts and satiny soft pink blouse. This is a great look for a spring brunch with the girls. The white open-toe ankle strap platforms add a perfect touch to this look. It feminine, romantic, and modern. Which look is your favorite? Let us know in the comments section and in the poll! Which Spring Preview Look Would Is Your Favorite?